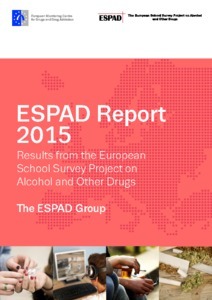 Home > ESPAD report 2015 results from the European School Survey Project on Alcohol and Other Drugs. Kraus, Ludwig and Guttormsson, Ulf and Leifman, Håkan and Arpa, Sharon and Molinaro, Sabrina and Monshouwer, Karin and Trapencieris, Marcis and Vicente, Julian and Már Arnarsson, Ársæll and Balakireva, Olga and Bye, Elin K and Chileva, Anina and Ciocanu, Mihai and Clancy, Luke and Csémy, Ladislav and Djurisic, Tatijana and Elekes, Zsuzsanna and Feijão, Fernanda and Florescu, Silvia and Franelic, Iva Pejnovic (2016) ESPAD report 2015 results from the European School Survey Project on Alcohol and Other Drugs. Luxembourg: Office for Official Publications of the European Communities. This report is based on the information provided by 96 043 students from 35 European countries, 24 of them being Member States of the European Union. About 600 000 students have participated in the successive ESPAD data-collection waves, making the project the most extensive, harmonised data collection on substance use in Europe. This report presents the results from the sixth wave of data collection, conducted in 35 countries during the spring and autumn of 2015. It gives a comprehensive picture of the present situation among European young people as regards the use of tobacco, alcohol, cannabis and other substances, as well as an overview of trends in 1995-2015.